For some, winterizing a home is about sealing up the drafts and getting the heating system checked in order to guard against the oncoming chill. But for those of us susceptible to seasonal mood disorders, winterizing can also mean taking additional steps to guard against the winter blues. Often triggered when the days become short, Seasonal Affective Disorder (SAD) can be a serious condition that requires treatment with psychotherapy, medication and light exposure. But, to combat relatively minor blahs tied to the dim-winter months, there are simple home design strategies to help keep your mood soaring all season long. Consider the interior surfaces of your home – wall colors, woods, ceilings, flooring, cabinets – the color tones of these are responsible for creating a welcoming atmosphere in the winter…or not. Architect Catherine Call, owner of Blue Sky Studio, notes: "Some people like to feel cozy so they use a lot of warm earthy colors, and the golden glow can extend that feeling of sunset. Some people want it to be really bright so they have all white walls," she explains, cautioning that too much white can lead to a glaring, cold atmosphere. "I generally don't use a lot of blue or gray because I find that those colors are cool and quiet and don't provide a lot of warmth in the winter. Think about how white and gray our landscape is in the winter, so inside give your eye something to enjoy." But even the warmest hued walls won't be seen in their best light without the right lighting design. Years of research shows that light deficiency is the leading cause of the winter blahs. As the daylight decreases during winter months, your brain secretes more melatonin, a sleep-related hormone that can make you feel sluggish. To help you fight the forces that drag you down, consider re-examining your home lighting. Whether screwing in halogen, fluorescent or LED bulbs, know that "anything is better than nothing," says Pat Tomlinson, a lighting consultant at The Lighting Gallery by Brown's in Anchorage. (See sidebar at right for Pat's tips on choosing light bulbs.) Adding lamps, installing track lights, or simply switching out dim bulbs for brighter ones will have an instant effect on the room, and one's mood. A well-placed fixture is just as important as the type of light chosen. "Light that hits reflective surfaces makes the room look bigger," she says. "If you light only the middle of the room it makes the room look small and dark." Bouncing adjustable track bulbs off the ceiling and surrounding walls makes the room seem bigger, the ceilings higher. Also important to consider is how the color temperature of the bulb will mix with the colors in the room. Warm whites cast an amber glow, suitable for cozy interior spaces, while cool light and natural light (or "daylight") bulbs cast a blue hue, appearing brighter like natural daylight which, to some, can seem harsh in the winter. The color of the light will mix with the color of the walls, flooring and furniture it lands upon – for example, blue light on yellow-hued walls creates a greenish tone, while amber light on yellow or brown-hued surroundings creates a warmer glow. Large picture windows are perfect for taking in the gently falling snow against a backdrop of spruce trees, but when the sun goes down behind the winter wonderland scene these same panes can become a black hole in the middle of the wall. Warm up the blank space by installing low voltage landscape lighting in the yard, says Tomlinson. "Shine a light up into the trees," she recommends. "Or place a spotlight above the window outside." Call says that if there's a deck or a soffit directly outside a window, adding some well-placed lighting to those features will give the eye something to focus upon. "Plus," she adds, "windows can be cold and you can lose heat." Her solution is to install or place a heating source underneath the window inside. Dave Northup, general contractor and owner of Northup Construction, also talks up the importance of paying attention to windows. He says keeping them unblocked by overhanging decks or tree branches will let in more light during the day. But what about rooms that get little to no sunlight like a bathroom or a north-facing office? "You can put in solar tubes that bring in sunlight," he says. "It's like a skylight but they're 18-24 inches in diameter. You run the tube through your attic trusses to the outside." Solar tubes can also incorporate ventilation. In the winter we close up our houses to keep in the heat, Northup says, "so stagnant and stale air is going to affect your mood. If you have healthier air you'll feel better." In homes with poor ventilation, he says a good trick for swapping out the old air is to run the bathroom fan for 90 minutes a day in the winter. If you're gazing at a white landscape wondering when the first signs of spring are going to show up, wait no longer. 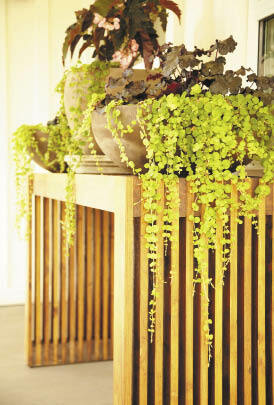 Adding some greenery to your space can instantly lighten the mood and brighten up your home. "There are studies that show that when plants are in the area people generally feel better and when people are surrounded by plants they are happier overall," says Monica Emerton, sales and design manager at Green Connection. Plants are also an excellent household helper in the winter, she notes. During the long days when the furnace is on and the doors and windows are shut making the air in our homes dry and stale, plants can help clean and purify the air. "They reduce a lot of the toxins that can get trapped inside," she says, and they put some humidity back into the dry winter air, too. So what can grow in little light? "Dracenas are your best bet; they are a low light plant." She also recommends pothos, or any of the palms which all do well in darker, winter conditions. Emerton reminds us that although the outdoors may be buried under snow for a few months this doesn't mean that the indoors must stop blooming, as well. Plants help add life and energy to our spaces – and a taste of summer is a great winter-blues chaser.